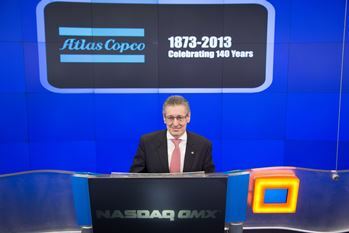 Atlas Copco CEO Ronnie Leten marked the company’s 140th anniversary earlier this year by ringing the opening bell at the NASDAQ MarketSite in New York’s Times Square. The bell ringing signified the beginning of the day’s trading and the start of a year-long anniversary celebration for Atlas Copco. PT Atlas Copco Nusantara hosted its celebration at the Jakarta headquarters with over 200 attendees. Directors representing the portable air, construction, mining, rock excavation and industrial industries were also present. Each director addressed the assembly regarding plans for future customer center employee training and improved customer satisfaction. Atlas Copco's CEO Ronnie Leten. Headquartered in Sweden, Atlas Copco began in 1873 with the idea that the country should become more self-sufficient in railroad building. As the years passed however, development, technical innovations and competition drove the company to diversify its product portfolio. In the 1950s the first major strategic international acquisition was made with the purchase of Arpic Engineering, a Belgian compressor company. 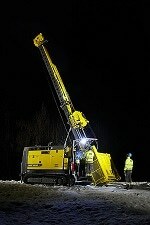 From its start as a manufacturer of products for the railroad industry, Atlas Copco has expanded and adapted to hold world-leading positions in mining and construction equipment, compressed air and gas equipment, industrial tools and assembly systems. Through 140 years of innovation and acquisition, Atlas Copco has grown to serve customers in over 170 countries. The group first came to Indonesia in January 2008 and is currently headquartered in Jakarta. PT Atlas Copco Nusantara offers capital equipment, field support and auxiliary product installation through the central office as well as ten regional locations. PT Atlas Copco Nusantara has become a strong leader in the coal and gold mining industries and sees potential to grow in exploration, construction and geotechnical fields. It is the exclusive distributor and parts and service provider in Indonesia for a number of allied companies such as FSI fire suppression, Lincoln lubrication systems, Gates hoses and fitting services and Banlaw fuel management. Branch locations in Balikpapan, Samarinda, Pekanbaru, Timika, Sumbawa, Adaro, Satui, Berau and Sangatta also held celebrations for the anniversary. Historical achievements and recent innovations were presented. Director Jess Kindler spoke, conveying his three-year plan for PT Atlas Copco Nusantara.